The tank battery is likely to be the largest part of your above-ground operation. Its job is to clean and store oil you pump until it’s ready to be sold. It’s makeup will depend on a number of factors, but primarily on the quality and quantity of the oil you produce. Fluid produced from a well will include the oil you’d like to sell, and usually a number of other things as well. That will usually include natural gas, water, sediment, and other petroleum products like paraffin and asphalt. All of these have to be separated from each other before each can be sold, and that separation will be done by equipment in the tank battery. Most will at least include a separator, for breaking out natural gas. A heater-treater or gun barrel may also be necessary if you need to remove water and sediment from the oil. The amount of fluid produced will determine the size of the tank battery, and the size of the lines and tanks. The amount and pressure of the natural gas produced determines the makeup of the gas system. Likewise the amount of water, and its potential to corrode lines or tanks, dictate the water system setup. The sales system for selling by pipeline is different from one for selling by truck. All of these different needs have to be met by the tank battery. The tank battery can end up being somewhat complex. However, each part is used to solve a specific problem, or set of problems. If you’re thinking about designing your own tank battery, looking at a few examples of how those problems have been solved in the past can provide some useful insight. Figure 1. This tank battery sells directly to a pipeline, and therefore doesn’t need stock tanks. Some wells actually produce oil ready to sell, right out of the ground. When you’re pumping oil of that quality, the needs your tank battery has to meet are fairly simple. The battery in Figure 1 is an example of this sort of operation. Eleven different wells all feed into this one battery, which consists of a separator to remove gas and a sales system that’s connected directly to a pipeline using an LACT Unit. The separator is a large horizontal model to handle the volume of the wells that flow into it. This is fully automated and computer controlled, and therefore doesn’t need supervision. Instead, monitors sound alarms if problems are encountered. Figure 2. The header for the tank battery in Figure 1. 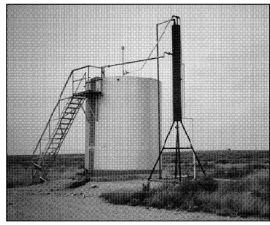 Pictured is the conical oil-saver hopper used for recovering residue oil. The header for this system is shown in Figure 2. As the separator is the only tank in the tank battery, there’s just two larger separator lines (with positive choke valves, heading to the upper left) and a smaller test line. Below the positive choke valves is the oil-saver hopper, where residue oil can be poured to be injected back into the system. Figure 3. A tank battery consisting of just one vessel. 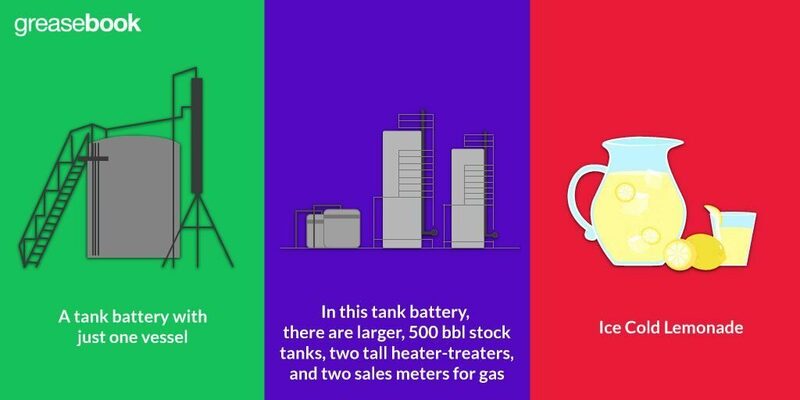 When a well isn’t producing any water and there isn’t enough gas to be captured and sold, the tank battery can be just one vessel for storing oil prior to it being sold. 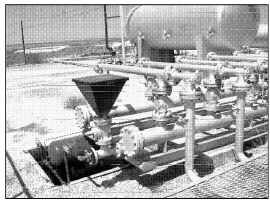 Other types of operations may have a similar setup, such as a gas well that doesn’t produce any water or condensate. It could also be the water tank from a gas producing well. In many cases, there’s no way to know without checking the details of the well. Figure 4. A tank battery with just one vessel. In this case, it’s a custom, shop-made gun barrel. You may only need one vessel when a well produces small amounts. In Figure 4, you can see a shop-made gun barrel being used with a covered pit. The gun barrel is a vessel designed to remove water and sediment from oil. This setup includes a backpressure valve on the gas line, which helps to prevent loss due to evaporation. In addition to the loss of volume, it also lowers the weight of the oil. Figure 5. A tank battery that includes a gun barrel at the left, a water tank and two stock tanks. Most lease pumpers will have to deal with separating water sediment from the oil before it can be sold. The amount of water and sediment that needs to be removed determines the number, size, and kind of that equipment. In Figure 5, you can see a tank battery that includes a gun barrel, on the far left. There is also two stock tanks and a water tank. A walkway crosses the lower three tanks, and there’s a ladder to the top of the gun barrel, all intended to make access to and testing of the contents easy. Figure 6. In this tank battery, there are larger, 500 bbl stock tanks, two tall heater-treaters, and two sales meters for gas. 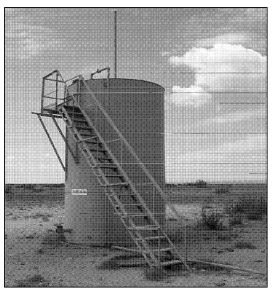 Other wells may need more complex setups. In Figure 6, you can see a tank battery that includes 2 heater-treaters, but no gun barrel. 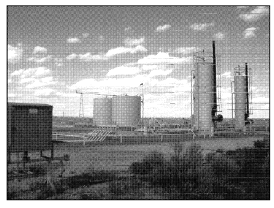 The smaller heater-treater in Figure 5, to the right, is a test vessel. Like gun barrels, heater-treaters use gravity and some other natural forces to separate water from oil. Heater-treaters also use heat to aid in the separation. This arrangement is most likely necessary because the oil is producing heavier oil, with an API gravity of 30 or lower. The addition of heat increases the efficiency of the separation process. In some cases, a gun barrel might also be required to give water more time to break out. Each tank battery is going to be designed around the well and what comes out of it, which means that each tank battery is unique. Any design that meets the needs of the operation and is laid out in a clear and efficient way, however, is going to be a good design.